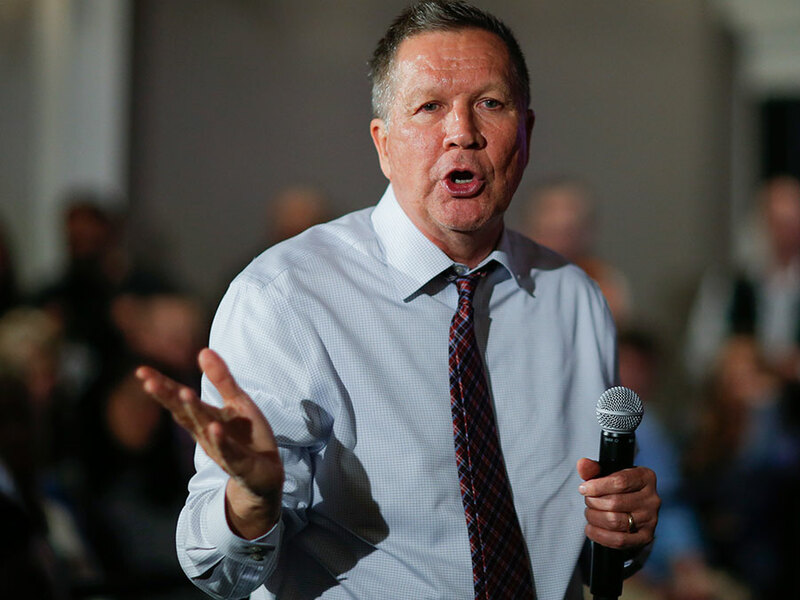 Miranda Green » Kasich can’t win outright, so why is he sticking with his strategy? Kasich can’t win outright, so why is he sticking with his strategy? UTICA, N.Y. — John Kasich took a play right out of his New Hampshire playbook Friday as he spoke to a standing-room-only crowd in a community college gymnasium here. He relied on his town hall prowess — a tactic that propelled him to an impressive second-place finish in the Granite State in February. The obvious goal: Come away from Tuesday’s New York primary with as many delegates in his corner as possible and look toward a possible contested GOP convention in Cleveland this July. For more than an hour, the GOP presidential hopeful talked candidly to the mostly working-class crowd from the Utica area. He seemed to be in his comfort zone as he conducted a discussion that ranged from small business growth to balancing the national debt to one of his stable topics — state specific sports references. Kasich’s tactic hasn’t changed much since he began his primary run in July of last year. He has for the most part focused on small groups of a thousand or so people whistle stop by whistle stop, encouraging attendees to be involved with his speeches and ask him questions afterwards. What has changed is he mathematically no longer has the chance to win the Republican nomination outright. He has no way of tallying up the 1,237 delegates needed unless the race goes to a contested convention, and it is looking like that’s what will happen. Many at the event Friday lamented Kasich’s dismal national delegate count — he currently has 144 to Donald Trump’s 744. Ted Cruz comes in second at 545. Others hoped that he will be able to pull out a heroic win at a contested GOP convention—if it gets to that. “John Kasich is a good guy but mathematically he can’t get there without a brokered convention but I think he’s hanging around long enough because he thinks that’s what is going to happen,” said Matthew Sullivan, 47, a retired policeman from Utica. For the Kasich camp, the Ohio governor obviously is that guy, and national polls have somewhat backed them up when it comes to his national electability. Three polls released in March suggested that Kasich had the best chance of the three GOP candidates to beat Hillary Clinton in a general election. “Ted Cruz and Donald Trump get destroyed by Hillary, and then [the Republican Party] will probably lose the Senate as well,” Schrimpf said, expressing a GOP doomsday theory. It’s the down-the-line, look-toward-the-convention thinking that has framed almost every race since Florida as THE important one. Even local government officials seem to be shocked that New York is a state in play for Republicans this primary. Republicans have 95 delegates up for grabs. “In my entire political life, which is my adult life in politics, we haven’t seen New York in play the way it is, our region in play the way it is. Usually we get lost in the shuffle,” said Oneida County Executive Anthony J. Picente, Jr., who introduce Kasich at the Utica town hall. A moderate Kasich success Tuesday could be what stands between Trump and an across-the-board victory in New York, plus give Kasich some added leverage in Cleveland. If Trump is able get to the 50 percent threshold of votes in the state, he will win all of the 95 delegates outright. He is currently polling at 53 percent, according to an average of state polls. Kasich is trailing in second place with 21 percent and Cruz is a distant third in New York at less than 18 percent. But Kasich maintains Trump is only a distant thought as he stumps in New York. Instead he says he’s focusing on his own success, even if his aspirations don’t seem very high.